Eliminate backbreaking reaching and bending for product beneath rack or in other awkward spaces. Roll your pallet out of its bay for more ergonomic picking then roll it back in for storage. Isolate the hazards of forklift traffic in your facility. Once your pallets are loaded onto dollies, they remain portable without needing a forklift or jack. Dolly construction features an aluminum channel frame that is both heavy-duty and lightweight. Rounded frame corners keep people and property safer as you transport your pallet load. Dollies come in a variety of sizes, from 36" to 48" in length and width. They are compatible with any pallet type without legs as well as other containers when the appropriate size is chosen. Select 6, 8 or 10 non-marking rollers. Sealed semi-precision bearings are low-maintenance and 17 times more durable than the industry standard. Choose a turning dolly for maximum load maneuverability. 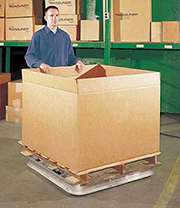 This model is perfect for moving pallets and containers through your facility. It features slightly enlarged center rollers that tilt to allow turning, so you can rotate your pallet or steer it around corners. If you want to add a towing hitch to your dolly, be sure to select the turning style. When you need to roll your pallet along a straight path, select a non-turning dolly. This model is great for accessing product stored under rack or in other hard-to-reach areas. It has uniform rollers that maintain a forward-backward bearing, helpful for moving loads in and out of tight spaces without rotating or bumping.